Typical and traditional pesto recipes include beaucoups of olive oil. I add only a little oil, and make the bulk of the pesto volume the basil. Because of the reduction in oil, do the final purée at the last minute, so the pesto stays fresh and green. Fill your pasta boiling pot and set the water to boil before you turn to pesto-making. Basil that’s just beginning to flower/seed. Start by rinsing the basil and pulling the leaves from the stems. Make sure you exclude any tops that are beginning to bloom or go to seed. My favorite pestos have nuts included. I stick to pine nuts, but you could also use almonds, walnuts, or even pecans (they’re New World)—but just pick one. Toast them gently in a skillet or toaster oven; watch very carefully—because they are high-fat, they will burn easily. Set aside on a plate to cool. The other ingredients you’ll need to do my version are salt, garlic, and parmesan cheese. You could also add some pecorino romano cheese (I usually don’t; just make the total amount of cheese the same as listed below, with no more than barely half the cheese romano). Grate the cheese, or chop enough that the food processor can purée it. If the cheese is in bigger pieces, process the chunks first, then add the rest of the ingredients and make the first phase of the purée. The amounts I give are approximate. This is about the right amount to blend with two cups of basil leaves. 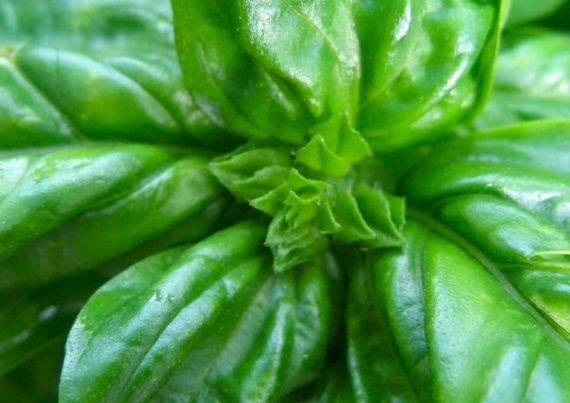 If you have more or less in your basil pile, use this ratio as a guide. Put the above five ingredients into your food processor, and drizzle in 1-2 T olive oil as you pulse them together. You will probably have to several cycles of scraping the sides of the bowl and pulsing again. If you want add a bit more olive oil, go ahead. Now you have a mixture that is puréed and ready for the basil. Plop it in the food processor bowl and WAIT. 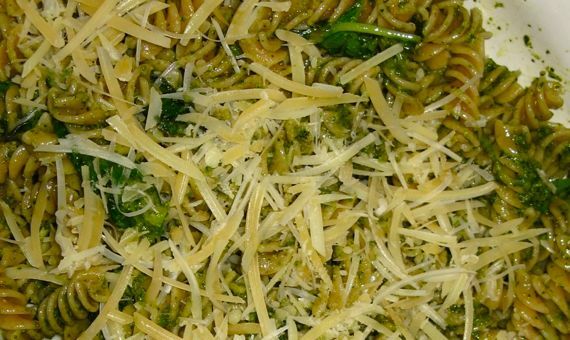 Do whatever other dishes you have to make, and when the pasta is draining and steamy, quickly process the basil into the cheese mixture. Scrape the bowl sides several times if you need to. Dump the pasta into a big bowl and add the pesto and stir to blend. A so-called pasta fork may be helpful, depending on the shape of the pasta. If you are having trouble with your patience mixing the pasta, you could add more oil. For reference, in a restaurant version of pesto, the amount made with two cups of basil would have well over one cup of olive oil added. Serve with additional grated parmesan cheese on the side. Good with a big tossed salad.